Former Navy pilot John Ryan McLaughlin was grounded after suffering a seizure. The culprit? Videogames. 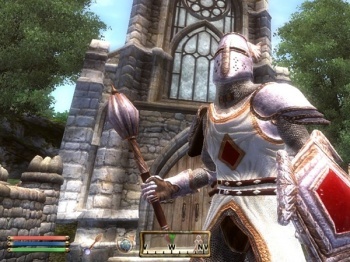 McLaughlin has filed a lawsuit in Caifornia which claims that while playing the PlayStation 3 iteration of Bethesda Softworks' The Elder Scrolls IV: Oblivion in March of 2010, the game's graphical effects caused him to suffer a grand mal seizure during which he experienced "excruciating pain" and broke a bone. As a result, the Navy stripped him of his flying credentials. It should be noted that McLaughlin's suit specifically alleges that the game in question is "defective and dangerous" by virtue of how quickly it "strobes" lights at the player. "The product was so designed that it exceeded the upper acceptable limit of more than 3 flashes over a 1 second period, as well as acceptable spatial pattern and luminance flash limits. These risks were not made known to the plaintiff and/or an ordinary consumer prior to the time of purchase," the lawsuit claims. Though actual monetary amounts are unknown, McLaughlin is seeking punitive reparations, damages for negligence, breach of warranty, and product liability from Sony, Bethesda Softworks and Bethesda parent company Zenimax. Normally this sort of lawsuit would be met by rolling eyes and audible scoffs -- have a look at the comments if you don't believe me -- but I think this case might actually serve an important purpose, regardless of its eventual outcome. Game packaging has specifically warned consumers about the danger of seizures as far back as I can remember, and while you'd think that would sink McLaughlin's case by itself, it's entirely possible that the court would rule in his favor simply by virtue of the fact that no one actually reads those warnings. Maybe I'm simply jaded by our hyper-litigious culture, but I could see a lenient judge seeing this as an opportunity to make an example of prominent gaming companies.